Welcome to the weekend! Its going to be a hot one here. 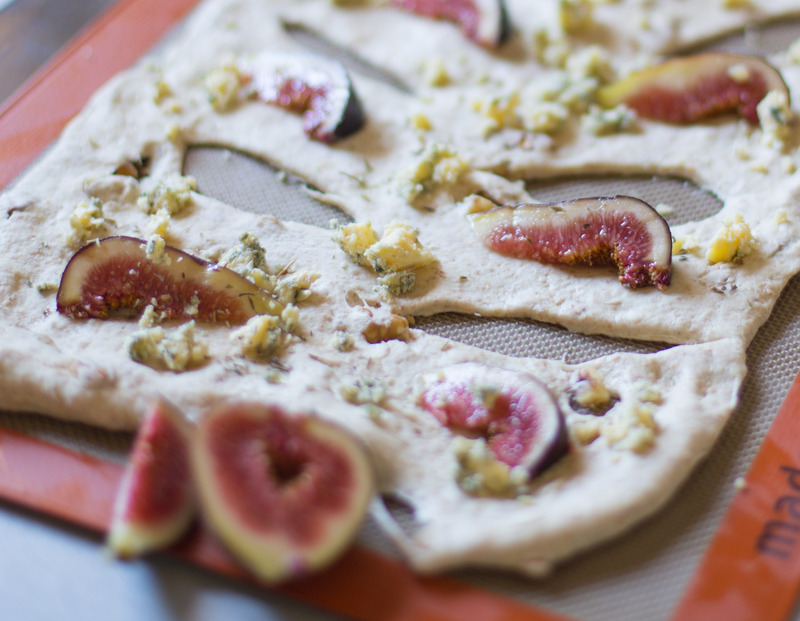 I figured this would be appropriate for the weekend because A. it takes a fair few hours to rise B. its that kinda weekend type of bread and C. gosh who doesn’t love fresh figs or blue cheese??? I mean look.. This will make two generous Fougasse, 1 to share and 1 to keep I say! This French flat bread is said to resemble an ear of wheat and is mainly found in the area of Provence. Correct me if I am wrong! Mix together the flour, starter and salt in a stand mixer or by hand. Slowly add the water allowing it to incorporate with the flour before you add more. You want and nice soft dough with a bit of moisture in it. Not a dry stiff dough. Knead the dough on a bench for around 15 minutes if your muscles can handle it or 10 minutes in the mixer. The dough should feel smooth and elastic. Pop the dough into a oiled bowl with a tea towel or plastic shower cap over and let it prove until double size. Put in a nice warm spot where the temperature will stay constant through the full rise of the dough. It will take longer to rise than commercial yeast so expect 3-4 hours. Once this has happened take the dough out and pop on a floured work surface sprinkle over the walnuts kneading this in for a few minutes. Don’t worry you will have some escapees but just poke them back in. Half the dough into 2 equal pieces and flatten to make a rectangle mine were around 20cm/40cm. Grab the flattened dough and lay this on a lined floured baking tray. Take a sharp knife, blade or pizza wheal and score 6-8 diagonal cuts down the long sides of the dough i.e. 3-4 each side. Stretch the slits you made in the dough, as they will need room to prove. Now the fun part…the figs and cheese. 8th the figs and crumble up the blue cheese. 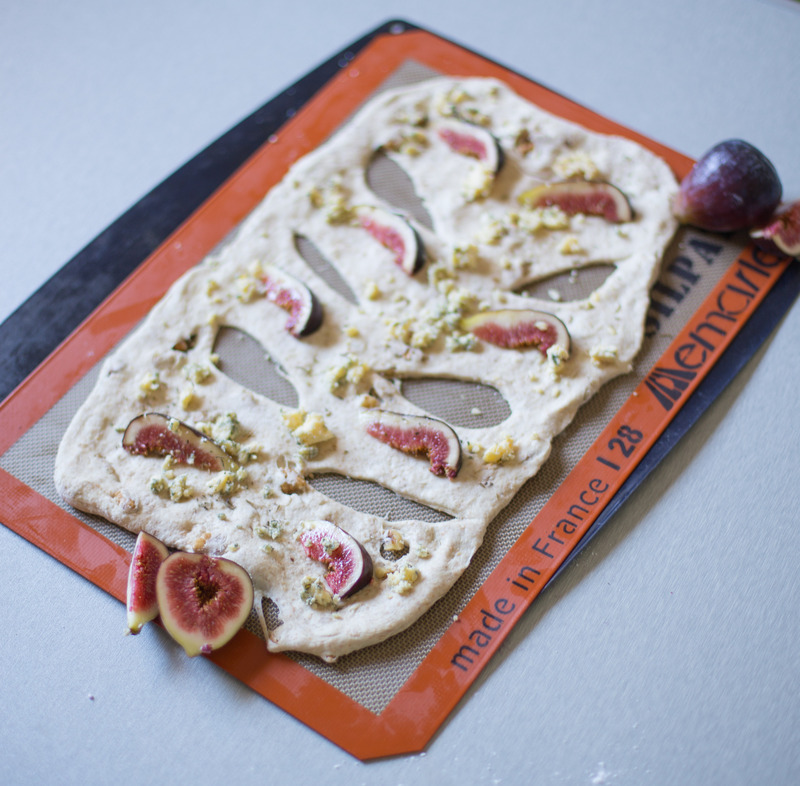 Dot the figs and cheese over the dough and then sprinkle the thyme over. Cover with a tea towel or greased plastic wrap and pop somewhere warm again until doubled in size probably another 3 hours. Preheat your oven to a hot 220*c with a pizza stone on the bottom rack (if you have one but no panic it will still work). 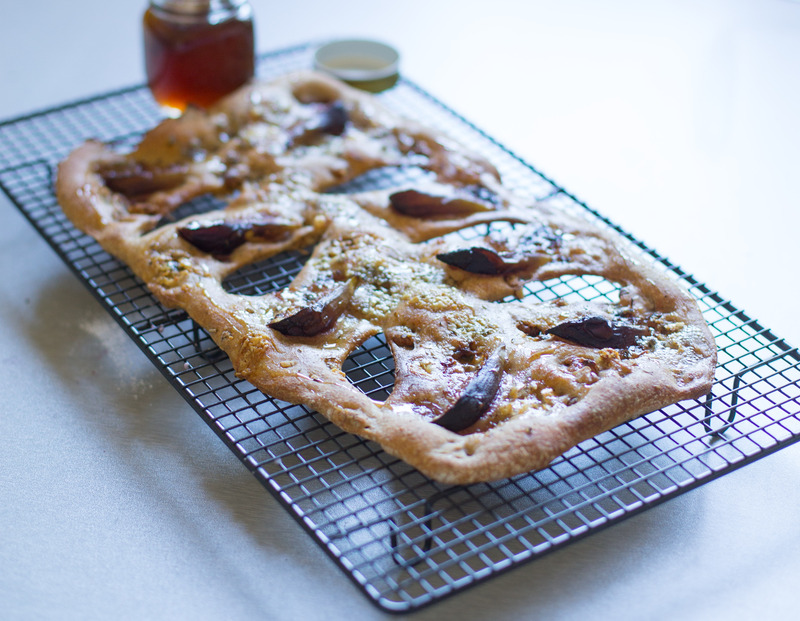 When you are ready too cook the fougasse grab a handful of ice and as you pop the fougasse (on the baking tray on top of the stone) in to cook throw the ice on the floor of your oven shutting the door super quick to allow the steam inside work its magic on the crust of the bread. Cook for around 20-25 minutes until browned and crunchy. 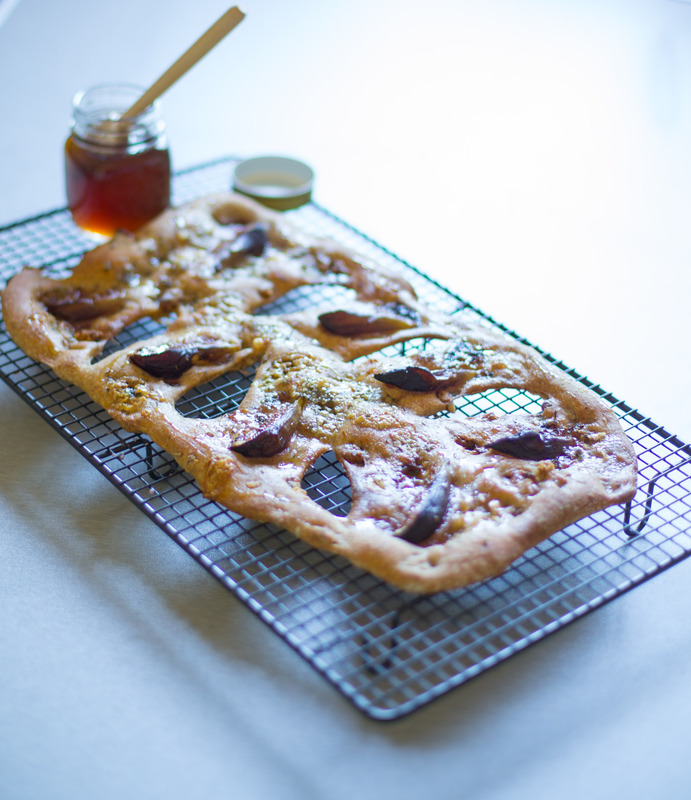 Grab some lovely honey and drizzle over the warm bread. Cool on a wire rack ready to eat accompanied by a scrummy dip and a glass of vino. See you at the next recipe, until then..
Hi I am Olivia, a stay at home mum to 3 active children, a husband and 8 chooks. We live in regional Victoria, Australia and moved here 2 years ago from the UK (I’m actually a Kiwi). We as a family are vegetarian and enjoy trying many different foods, or not….toddlers in the house! I have a internal drive to prove to people that vegetarian food is yummy, filling and exciting.